DEARBORN, Michigan – A patriotic ceremony in Dearborn on Veterans Day honored all veterans and service members, with special recognition given to the 2014 Veteran of Year: U.S. Navy veteran Leo Barrett. Conducted in conjunction with the Dearborn Allied War Veterans Council (DAWVC), the annual public event took place in the Michael A. Guido Theater of the Ford Community and Performing Arts Center. DAWVC Commander Sean Green and Dearborn Mayor John B. O’Reilly Jr. paid tribute to U.S service members and thanked them and their gathered families and friends. They expressed gratitude in particular to the DAWVC 2014 Veteran of the Year Leo Barrett for his continued commitment to helping fellow veterans. 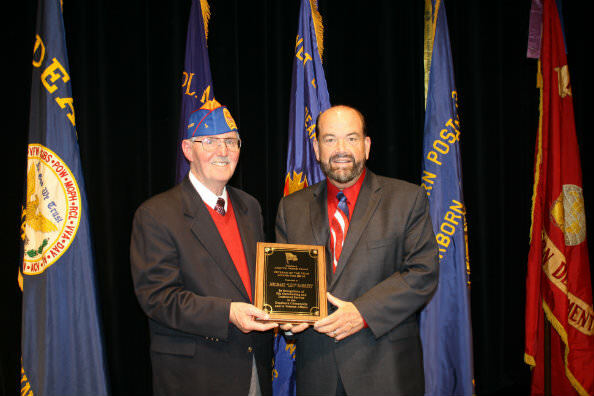 Barrett is the senior vice commander of the AmVets – General Henry Dearborn Post 4. He served eight years as its commander, was also one of its founding members and has continued to be a member for 39 years. Among his many volunteer commitments Barrett has been DAWVC Commander. He packs and delivers gifts to hospitalized veterans, attends schools to discuss patriotism, coached youth football, raised money for youth and veterans and is active in the Knights of Columbus and the Fraternal Order of Eagles. Barrett who served as a cook aboard the USS Gearing Navy destroyer in the 6th Atlantic Fleet from 1954 – 1958, in his remarks, expressed gratitude to those who have been honored before him.